This week, our in-depth conversation features David Nihill. Born and raised in Dublin, Ireland, David, like so man of us, had a deep fear of public speaking. But, he found himself having to face this head on, when he reluctantly agreed to host a benefit comedy show he had suggested for a friend, Arash Bayatmakou, who had suffered a severe spinal cord injury (Comedy for a Spinal Cause). He quickly realized the best speakers were also often the funniest. Not because of the one-liners they threw into the audience, but because they knew how to tell a story in a way that made people laugh. In an attempt to learn the craft and also face his crippling fear of public speaking, he spent a year traveling the country pretending to be an accomplished comedian and talking his way onto as many comedy show stages and festivals as possible. Along the way, he not only overcame his fear of speaking, he began to deconstruct the best story-driven comedy and figured out a methodology he could not only bring to the stage himself but also teach pretty much anyone. Even people who consider themselves to have nearly zero ability to tell stories or be funny. 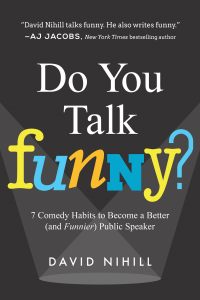 He shared this approach in a book, k, Do You Talk Funny?, then launched a community, writers platform, and conference series under called FunnyBizz Conference: Where Business Meets Humor, with the intention of helping everyone from speakers and executives to content creators tap the power of storytelling, comedy and improv to engage readers and audiences on a whole new level. David realized he had learned something in the process that could be valuable to other businesspeople — most people, with the right techniques, could learn to be funny, (at least on stage) and learning how to structure a comedy routine involves the exact same skills as making a successful presentation. He now also runs an agency that lets anyone from executives to speakers to anyone who wants funnier content tap a team of freelance comedy writers to punch up anything from a keynote or best-man’s speech to an article or boardroom presentation. Which TED talks have the most laughs per minute. How comedy & copywriting are correlated. That US comedy is a testament to tight TV ready writing. How many laughs per day a baby has compared to adults over 35 years old. That CEOs perceive people with a sense of humor as doing better work. Camp GLP is about connecting, playing, lighting up on a deeper, more meaningful level. One that bypasses the normal superficial yadda yadda yadda and makes a beeline to the soul. Come join us.